SYNOPSIS: Lighthearted "Midnight Run-style" take on the D.B. Cooper legend. The same year he did the super heavy Prince of the City Treat Williams made this potential crowd pleaser that never really found an audience. The film itself seems to be about 10% facts and 90% imagination. The real D.B. Cooper (and the bulk of the money) was never found. 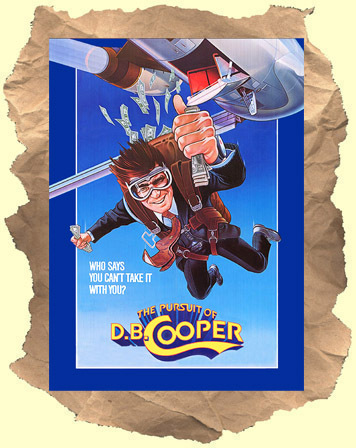 The film kicks off with Treat's Cooper parachuting out of the hijacked plane with his money and landing in the forest. A quick clothing change and he's on his way. He hooks up with a game Kathryn Harrold who helps him in his escape plans. Meanwhile, stuffy insurance investigator Robert Duvall is hot on their trail. Paul Gleason (the teacher from Breakfast Club) does a surprising turn as a sleazebag trying to get some of that stolen loot. Car crashes, lots of humor, a great plane vs car stunt, a boat chase down Snake River and some near slapstick fill out the film. This much neglected film is very entertaining. Note: this print is not the PAL dvd release (which is terribly pixelated) but a transfer from the SP mode vhs version.